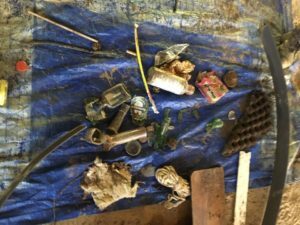 Everyone is welcome to attend a Creek Week activity and to join in the April 13th County-wide creek Clean-up. Please save the date Saturday, April 14 for the Sacramento County-wide clean-up of our creeks. The clean-up is from 9 until noon and will be followed by a Celebration at Carmichael Park from noon until 2. 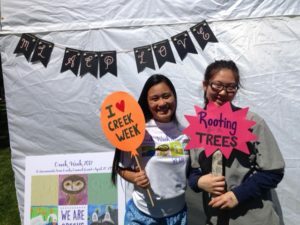 Our Creek Week website http://creekweek.net/ will be ready for sign-ups by the end of February. 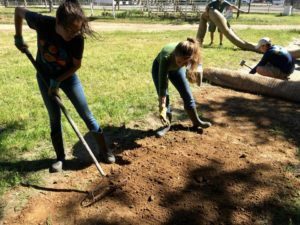 Creek Week is fun, and it feels good to work with others to improve our natural environment. Watch for our schedule of activities that happen the week before the clean-up. Creek Week has something for everybody! 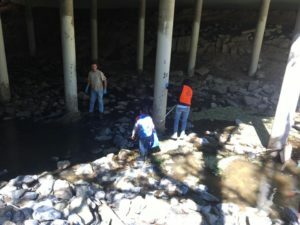 Gary Hare had the help of Mira Loma High School students in collecting and categorizing the garbage under the bridge on the morning of the Creek Week clean-up – Saturday, April 29, 2017. Read his report for details and more pictures. Wonder why there were so many glass items found here? A portion of the trash collected. It was all sorted on the tarp. Some of the trash was washed to this spot and some of it was generated here. What types of activities might take place under this bridge? 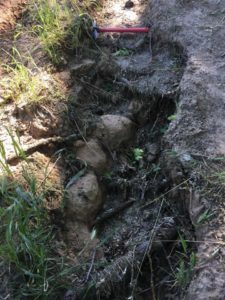 Roots of nearby mature oaks were being exposed as the gully formed; for scale, see the hand tool at top of the picture. Blanket being anchored into top of the slope. 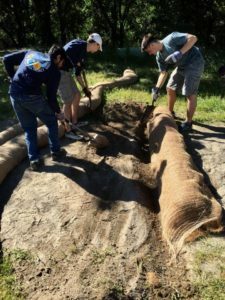 This specially made fabric is made with biodegradable materials that turn into compost as the project ages – we need to transition away from erosion control materials wrapped in plastic mesh. As his classmates filled-in and packed the ruts and gully below, George began setting pins to anchor the blanket to the face of the slope. 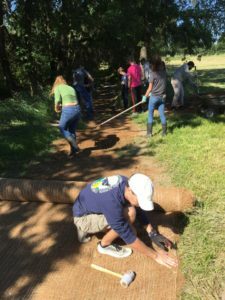 Once the soil was packed, we scored and top-seeded the surface with three species of native grass – California fescue, purple needle-grass, and creeping wild rye from Hedgerow Farms (courtesy of Zarah Wyly at the Sacramento Tree Foundation). 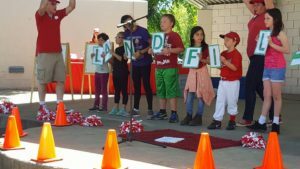 Red Shoe Productions entertained us! See more photos. Thank you to Carmichael Recreation & Park District for hosting the Celebration at beautiful Carmichael Park; to Carmichael Chamber of Commerce for cooking and serving lunch to over 1,000 people; to the twenty exhibitors who shared entertaining educational activities; to Mira Loma High School and Sac Suburban Kiwanis and the other volunteers who helped set up and run the Celebration. And thank you to all who attended. 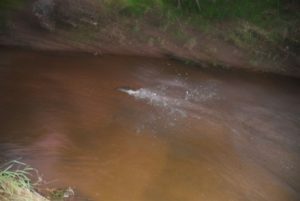 John Mayfield reported a sighting of a Chinook salmon on a small tributary running through a residential/rural neighborhood north of Orange Grove Ave. This makes 6 now so far this fall! Dec. 11, 2016 – John Mayfield reported sighting a large fish, most likely a salmon, swiftly swimming upstream under the Bus. 80 Bridge upstream of Watt Ave at about 9 a.m. Randy Smith spotted a fish, a salmon or Steelhead, moving upstream quickly from the Pasadena Ave. footbridge about 10 a.m., about 2 miles upstream from the other fish at Bus. 80. 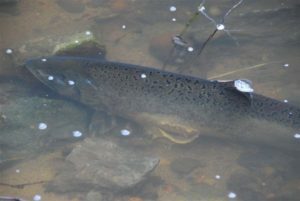 Dec. 4, 2016 – Randy Smith spotted the Chinook salmon pictured below just downstream from Garfield Avenue. Upon comparison with his earlier photo from Nov. 28 (see Nov. 30 blog post), Randy verified that this is the same fish based on the mottling pattern near the dorsal fin. 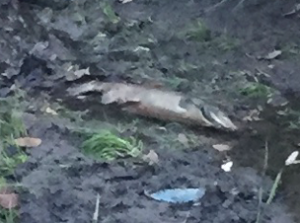 (This salmon downstream from Garfield Avenue was verified by Bill Templin and Katie Cantrell). Another live Chinook upstream of the Pasadena Ave. bridge. 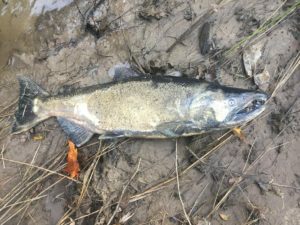 So, this is now the 3rd salmon that has been reported at the Pasadena bridge this fall! And the 2nd documented in photographs. Many of you may not know that we have Chinook salmon in some of our local urban creeks! If you live by a creek, please let Bill Templin wetemplin@att.net know if you’re seeing salmon in your local creek. Gregg Bates leads Salmon Surveys on Dry Creek near Eureka Rd. in Roseville. This year Gregg held a survey on Friday Nov. 4 and is holding one this Friday, Dec. 2. 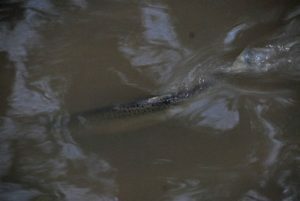 Last winter, Bill and volunteers documented the first Chinook in Arcade Creek (2 live, 1 carcass). So far this year, 3 Chinook Salmon have been reported and one has been photographed so far!! This is the first male we’ve documented since we began monitoring Arcade Creek in December 2015!